On a hot summer day in central Louisiana, Iowa Army National Guard Sgt. 1st Class Chris Jorgensen, of Garrison oversees the Unmanned Aerial Vehicle (UAV) training of his 2nd Brigade Combat Team, 34th Infantry Division Soldiers. Iowa and Minnesota Army National Guard Soldiers are currently training at the Joint Readiness Training Center (JRTC) in Fort Polk, La. to obtain flight validation on the Raven UAV during their two-week annual training. 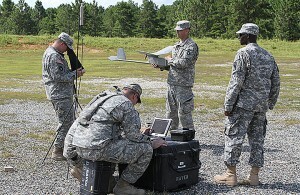 The Soldiers run tests and checks on the UAV system prior to hand-launching it. Once it’s airborne, they use the remote ground station controller to guide the UAV’s flight. They also learn to work with the Falcon View computer program, which is a multi-platform mapping and mission planning application used with the reconnaissance aircraft. “Before every launch we have a series of checks we have to do to make sure everything is working well with the bird before it goes up in the air,” said Iowa Army National Guard Sgt. 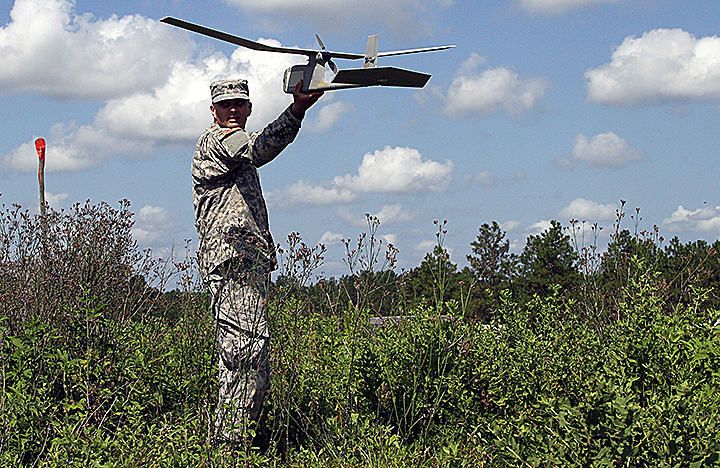 Ray Deojay, of Huxley, a certified UAV operator with the Headquarters and Headquarters Company, 334th Brigade Support Battalion. Scroll down to see a video about the Iowa Guardsmen’s training. The article continues after the video. While Soldiers go through a two-week UAV course to get certified, they are still unable to fly alone. They have to fly with a master trainer until they meet unit requirements to fly solo. Classroom training includes a safety brief and a discussion on air space control so they’re not flying the same air space as manned aircraft, as well as dialogue on some of the other hazards particular to operating at JRTC, said Jorgensen, a small unmanned aerial system master trainer. The mission of the aircraft is to collect reconnaissance and photos, observe a selected area and find the enemy before sending out troops. Besides military applications, these same skills Soldiers are learning today in Louisiana can later be used back home in Iowa as part of emergency response efforts. These same UAVs can also be used to provide real-time images to first responders during tornados, floods, or other natural disasters.